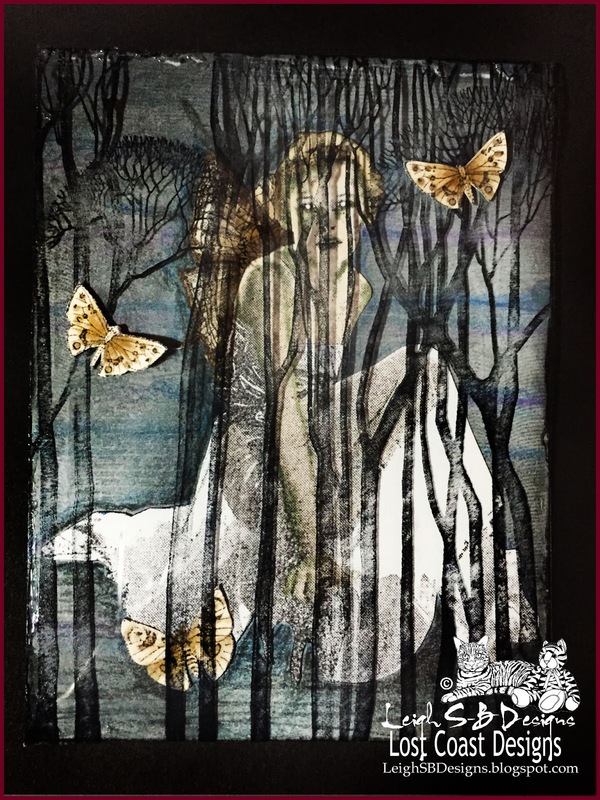 Velvet Paw Creations: Scary Fairy Blog Hop with Smeared & Smudged! Today I'm thrilled to be participating in the Scary Fairy Blog Hop hosted by Smeared and Smudged! This is the 1st Scary Fairy hop we're hosting and will hence forth be an annual event so now you've got yet another fabulous hop to look forward to every year! Yay! If you just happened to stop by my blog today and would like to start the hop from the beginning then here's the blog roll for you to follow. Leigh - You Are You! 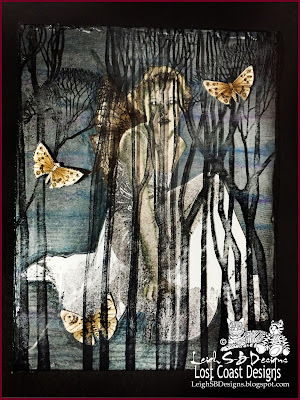 I used Lost Coast Designs Spread your wings and fly and Tall Trees to create my scary fairy project. 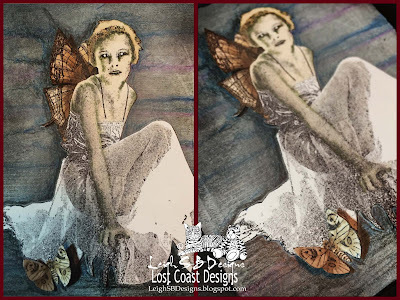 I stamped the fairy image onto neenah solar white cardstock twice, 1st in flannel grey Memento ink and then again with black Memento ink. I created an eerie misty scene behind the fairy with Prismacolor pencils and you can just make out the architectural building shrouded in the mist that is actually behind her. It was hard to capture the eeriness of it but it's there! I also cut the wings to add dimension. I fussy cut out the 2nd fairy I stamped in black and coloured her and the moths with Copic markers and added white dots to her eyes to enhance the eerie effect and layered her over the misty background. The trees were stamped with black StazOn ink onto a sheet of acetate and adhered to the top edge of the fairy panel to form the folded card. I then adhered the two fussy cut moths to the outside of the acetate panel. I just love how spooky she is as she peers out at you between the trees! I appreciate your visiting me today and leaving me your love, thank you!! Your next stop is Lost Coast Portal to Creativity! You really have given this an 'other worldly' feel Leigh. I adore your attention to detail. Fabulous. Superb images and layering. Love it! Wowzer!! She is one scary fairy!! Love the details on how she got sooo scary! Absolute genius my dear!! Love your scene Leigh and over stamping, gives a 3D effect! I love the effect you created here Leigh.